Gear Sport: How the Gear sport detect the workout done? 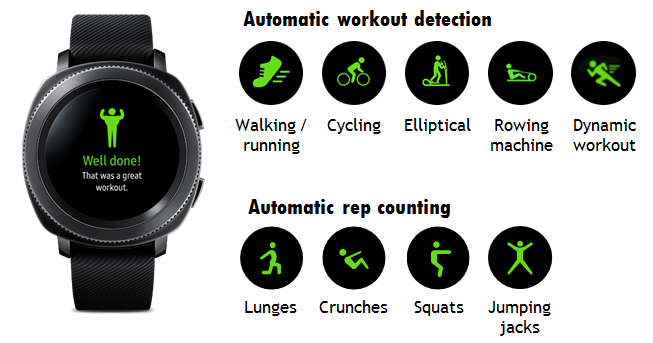 Automatic workout detection* has been upgraded to recognize continuous, high-movement activities as dynamic workouts. Whether you like tennis, soccer, dancing, or squash, the Gear Sport records your workout with heart rate data. * Automatic workout detection begins 10 minutes into a workout. Gear Sport: How do I charge the battery of my Gear Sport? Gear Sport: How can I track my swimming performance using the Gear sport? Gear Sport: How do I wear the Gear Sport correctly?